Georges Latil, born in Marseilles, was the engineer behind a number of inventions that have had a lasting effect on the automotive industry, not least of which is front-wheel drive. Latil was 19 when he was inspired by the knee patella to file a patent containing the principle of an articulated transmission, which allows the wheels of a split axle to be operated, giving them both a driving and steering function. He founded the company Avant-Train Latil, which offered motorised front-ends suitable for use on horse-drawn vehicles or car chassis. 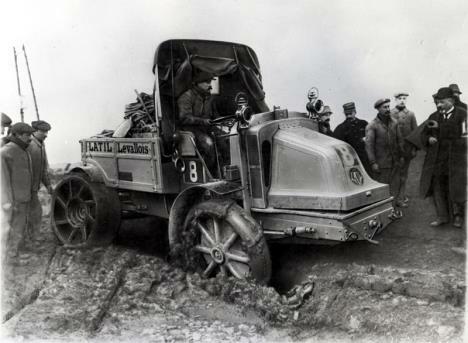 In 1911, Latil invented the first four-wheel drive all-terrain vehicle, which the Army ordered in 1913. The motorised artillery tractor (TAR) was used to tow 155 mm guns, replacing horses, and was used on the famous 'Voie Sacrée' (Sacred Way) supplying the battlefield at Verdun. Changing its corporate name several times, Latil produced trucks, commercial vehicles and agricultural or forestry tractors which were well known for their sturdiness. Series production that was too small-scale led to the merger of Automobiles Industriels Latil with the HGV division of the Régie nationale des usines Renault and Somua in 1955 to form the company SAVIEM LRS (Société anonyme de véhicules industriels et d'équipements mécaniques Latil Renault Somua). Awarded the Légion d'Honneur, Georges Latil died in 1961.